So You Want to be a Professional Calibrator too? Don’t worry, it’s glorious … now all I need is your credit card number. So what does it really take to be a professional calibrator and how actually does the industry work? 6000+ people have gone through the ISF program since it started in 1994 ish. About 300 or so have actually been able to make a go of it either full time or part time with most doing it part time. I know of about 15 people doing it full time and are successful at it. That’s a 0.25% success rate for full time or one in 400 who take the ISF program will be able to make a go of this full time. In Engineering School in the first year, the teachers used to tell the students to look to the left and right of them as those students would not be there at graduation four years later. This is much, much worse as one person each year of ISF classes will be able to do this full time. That’s 12 classes with 30 people in each class. The part time people have a better rate of 5% and these are people that actually might do more than 1 or 2 sets a month. I was considered one of those part timers for many years, but not anymore … left the day job three years ago. On a yearly basis, I do about 200-250 TV units, although not all are actual paying jobs. Some (many) just get the ISF certification because they want another set of letters to hang on their shingle … along with THX and PARA and CEDIA. It works like this on the THX side of things too as anyone displaying only a THX Certified Professional status and nothing more is really only in it for the letters. 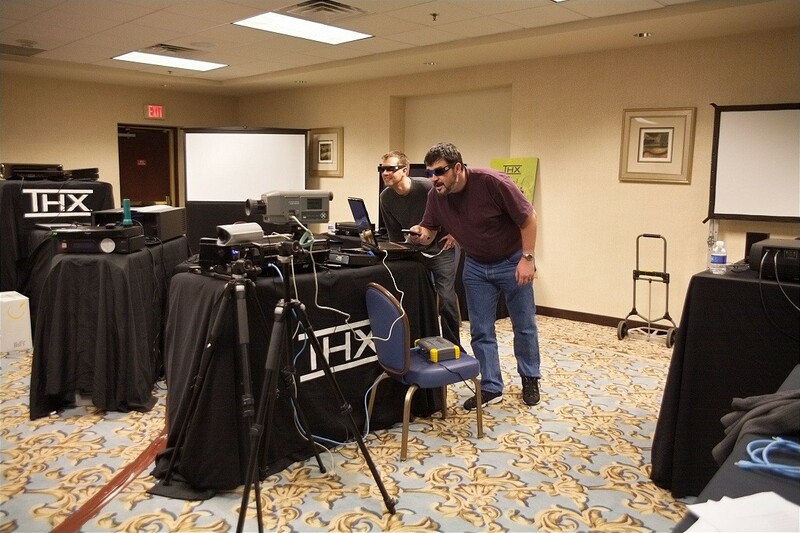 It is a much longer and costly road to get the THX Certified Professional Video Calibration status. Many would be calibrators think this is something they can turn off at the end of the day. Well that explains their lack of success. The person has to be a thinker and willing to find answers for himself. If he has to ask someone everytime, it will not work out. It will turn out badly. For someone like myself with my moderate level of business … it is about 40-60k a year and I am comfortable with that. I don’t do home install or other things like that. It is from pure calibration and teaching. I still like to think of it as a hobby job. You have to invest some money into this calibration game in order to play … and compared to other endeavors out there …$6K-10K for training and equipment is cheap. No other capital costs and you can walk away from it at anytime unlike a storefront that has to shut down. The THX class is a good start … at the current $2000 price point. If you take the ISF class for $1800, then you start at a significant disadvantage on this road to being a professional calibrator. There will be more displays to work on in one program and many different brands as well. They will also teach you about how the real calibration relationship with clients works and what to do and what to avoid. One program also supports their calibrators when they get into the field while the other program essentially says “good luck” and nothing more. Currently looking at software and hardware at a min of $4000 … to start. So total investment is well under $10k … and no … it does not get you any work as the business does not work that way. Take what you learned and start to knock on doors … and offer your services for free for store fronts (not their clients). You will do a whole lot of free ones when starting up … and it is where you build the relationships. We have had about 350 people come through our program now over the last 6 years. We have an attrition rate of 50 – 60% or so. It seems high, but the numbers are higher on the ISF side. 90% or more. Remember the 50-60%? Well, about 10% were press so they were not expected to continue with the program and another 10-20% were industry representatives from places like LG and Samsung and JVC to name a few. That leaves the number at 30 – 40%. And there you go … no glory … but for those that have the passion, they can make something out of this. It should be noted that the calibrators that are encountered typically on the various forums fall into the category of the top 5% out there. They are at the top of the calibration totem pole. Don’t delude yourself into thinking that taking the THX class or the ISF class is an immediate path to glory. It isn’t. For every baseball player that makes it to the major leagues, ask yourself how many did not. So yes I still teach the THX class (only two of us in the world) and I consult for the Spectracal company too. And of course I still calibrate … traveling to Edmonton, Calgary, Regina, Winnipeg, Spokane, Seattle, Portland, Vancouver, Victoria, Toronto, Montreal, Ottawa and parts in between. This usually scares people off … but it is a brutal analysis of how the industry really works. If you have more questions … I’m around.